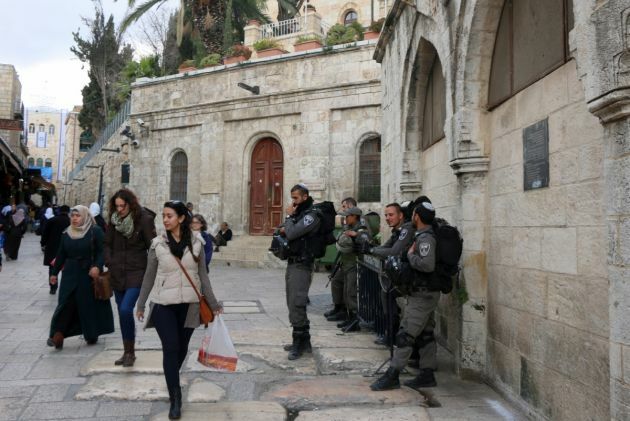 (Photo: © Peter Kenny / Ecumenical News)Israeli soldiers in Jerusalem's Old Town on Feb. 10, 2016. Israeli politicians have both condemned and praised the deputy chief of staff of the country's army who ignited controversy for comparing what happened in pre-Holocaust Germany to some current trends in Israel. Israel marked Holocaust Remembrance Day on May 5 with ceremonies and events across the country, honoring the memory of six million Jews massacred by the Nazis. 'It's scary to see horrifying developments that took place in Europe begin to unfold here,' Major-General Yair Golan said during a Holocaust Remembrance speech at the Kibbutz Tel Yizhak on May 4. His comments unleashed a deluge of criticism on social media, with The Jerusalem Post reporting Twitter users accused the general of "forgetting the lessons of the Holocaust." "The Holocaust should bring us to ponder our public lives and, furthermore, it must lead anyone who is capable of taking public responsibility to do so," said Golan, who was wearing the red beret of Israel's elite paratroopers. "Because if there is one thing that is scary in remembering the Holocaust, it is noticing horrific processes which developed in Europe - particularly in Germany - 70, 80, and 90 years ago, and finding remnants of that here among us in the year 2016." Education Minister Naftali Bennett called on Golan to correct his statement, so as not to be seen comparing Israeli soldiers to Nazis and giving credence to Holocaust deniers, The Associated Press reported. Bennett, the leader of the Jewish Home Party said Golan must "rectify" his mistake before "God forbid, our troops are likened to Nazis, with a kosher stamp from on high". Later, in a statement, which Bennett welcomed, the military tried to lay the controversy to rest, Reuters news agency reported. Israel's Justice Minister Ayelet Shaked said Golan was "a little confused" and his statement reflected "a lack of understanding, if not a disrespect of the Holocaust." His remarks attest mainly to a lack of understanding, ignorance, and a cheapening of the Holocaust," Shaked, also from the Jewish Home party told Channel 10 TV. "On such a day, I wouldn't even want to quote what he said." Golan said, "The Holocaust, in my view, must lead us to deep soul-searching about the nature of man. "It must bring us to conduct some soul-searching as to the responsibility of leadership and the quality of our society. It must lead us to fundamentally rethink how we, here and now, behave towards the other." "There is nothing easier and simpler than in changing the other," he said. "There is nothing easier and simpler than fear-mongering and threatening. There is nothing easier and simpler than in behaving like beasts, becoming morally corrupt, and sanctimoniousness." "On Holocaust Remembrance Day, it is worthwhile to ponder our capacity to uproot the first signs of intolerance, violence, and self-destruction that arise on the path to moral degradation," Golan said. "For all intents and purposes, Holocaust Remembrance Day is an opportunity for soul-searching," he said. "If Yom Kippur is the day of individual soul-searching, then it is imperative that Holocaust Remembrance Day be a day of national soul-searching, and this national soul-searching should include phenomena that are disruptive." In his speech the general made reference to an incident in Hebron in which an Israeli infantryman was filmed shooting dead a Palestinian assailant who was on the ground and subdued. That soldier, Sergeant Elor Azaria, is currently in a trial before a military tribunal on charges of manslaughter. The arrest and court martial have been met with fierce criticism from nationalist Jews who say that the soldier acted properly. "Improper use of weapons and violating the sanctity of arms have taken place since the IDF's (Israel Defense Force's) founding," Golan said. "The IDF should be proud that throughout its history it has had the ability to investigate severe incidents without hesitation. It should be proud that it has probed problematic behavior with courage and that it has taken responsibility not just for the good, but also for the bad and the inappropriate." "We didn't try to justify ourselves, we didn't cover anything up, we didn't whitewash, we didn't make excuses, and we didn't equivocate," the officer said. "Our path was – and will be – one of truth and shouldering responsibility, even if the truth is difficult and the burden of responsibility is a heavy one." "We very much believe in the justice of our cause, but not everything we do is just," Golan said. "We are certain of the high level of morality in the IDF as an organization, and we do not ignore exceptions by individuals. We demand from our soldiers the same that we demand of ourselves, and we insist that upstanding behavior and setting an example for everyone become second nature for every commander." "On Holocaust Remembrance Day, as we remember the six million of our people who were slaughtered in Europe, it is incumbent upon us to remember the 6.5 million, those living now, and to ask ourselves what is the purpose of our return to our land, what is appropriate to sanctify and what is not, what is proper to praise and what is not," the officer said. "Most of all, we should ask how it is that we are to realize our purpose as a light unto the nations and a model society," he said. "Only this kind of remembrance can serve as a living and breathing monument for our people – a worthy monument, a monument of truth." Golan later backtracked on his comments, reported The Telegraph quoting him saying in a statement released by the IDF that he "did not intend to compare the IDF and Israel to what happened in Germany 70 years ago. Such a comparison would be absurd and baseless." "There was no intention of creating any such parallel or to criticise the political echelons," the statement read. "The deputy chief of staff is a brave commander," Isaac Herzog, the head of the opposition Labor party, said, The Telegraph reported. "The crazies who started yelling about it need to know that that is how ethics and responsibility sounds like. We will not be scared of them or be scared of their screams and their profanities and we will continue to constantly support the IDF and its commanders." Israel's former justice minister Tzipi Livni condemned the backlash against Golan. "Instead of persecuting the deputy chief of staff whose conscience and values represent the IDF as a moral army that examines itself, it is more important for us to listen to his words," she said. Israel's defence minister Moshe Yaalon also supported Golan, attributing the criticism to "intentional, distorted interpretations" which constitute "an additional attempt of a worrisome campaign to inflict political damage on the IDF and its officers." Yaalon expressed his "complete faith" in Golan in a statement. "The role of every IDF commander ... does not end just with leading soldiers into battle, but also obligates him to set out a path and values for them, using both compass and conscience," he said. Israeli society has seen a rise in extremism in recent years with the government depending on right-wing support and the State-sanctioned expansion of settlements that are illegal under international law.